The 29th annual Lamport Festival of Country Life will be held in the grounds of Lamport Hall on Sunday May 29 and Monday May 30. And the Harborough Mail has five family tickets, worth £25 each, to give away. The Lamport Festival is one of the oldest countryside events in the region, attracting young and old alike each year. A traditional family day out in the Northamptonshire countryside, the aim of the festival is to show how those from the past used to live and work in rural England, while also providing plenty of fun in the form of entertainment, shopping, refreshments and rural displays. People will also be able to see the original garden gnome which can be viewed at Lamport Hall. In the Edwardian Stableblock you will find a large shopping yard with plenty of choice, from handmade crafts through to antiques and vintage collectables, and summer plants ready to take home. Inside the Food Hall you can buy artisan cheeses, home-baked breads and cakes, Northamptonshire honey, and other locally-sourced food and drink. In the beautiful parkland surrounding Lamport Hall you can talk to a blacksmith, see how wooden chairs and wooden spoons used to be made, and look out for traditional corn dollies. You will be surrounded by a staggering collection of steam engines and vintage tractors. Learn how the harvest used to be gathered in before the age of the combine harvester! The main arena will host a wide variety of dog displays on both days, kindly laid on by local groups and charities. Look out too for the cart horse, the owls and parrots, the farmyard pigs and the falconry display. Tickets will be available on the door. Adults are £9, senior citizens £8 and children (5-18) £5. Children under five come free. Family tickets made up of two adults and children are £25. 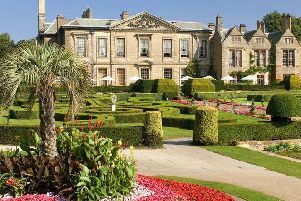 Lamport Hall is famous throughout the world as the home of what garden feature? Email your answer and contact details by Sunday May 22 to competition@lamporthall.co.uk.